Talk about a battle of saintly heavyweights! But that’s what you get when you make it to the Final Four of Lent Madness. It gets harder to just vote and get on with your day. Julian vs. Francis takes real discernment. Or a coin flip. In the first three rounds we’ve done Biographies, a Quote-off, and Legends & Kitsch. By this point you know something of the four who remain (next up Theresa of Avila vs. George Herbert). So for the Final Four we’ll be examining the saints in art. Ugly art. We’re looking for a single painting, statue, etc. of each saint. And it must be hideous. Any saint can be painted by Caravaggio or Titian but it takes a special saint to be represented in a garden sculpture (advantage Francis?) or clip-art or poorly done stained glass. However this is not to be confused with the prior kitsch category. Got it? And, while art is in the eye of the beholder, I’m sorry. It’s my blog so I get to be the art critic here. But I hope you use the saintly representations as “icons” into your selections. Here we have Julian of Norwich with her cat. She’s often depicted with a cat but rarely in stained glass. How would you like to sit next to this window in church? I wonder if it’s scratch ‘n sniff? For Francis, the choices are bewildering. But after consulting the marketing department at Clergy Family Confidential (I’m told they scoured Google images) we’re going with a Francis that appears to be the patron saint of jugglers. 1. Why does Julian look like she’s wearing a Hannibal Lecter mask? 2. 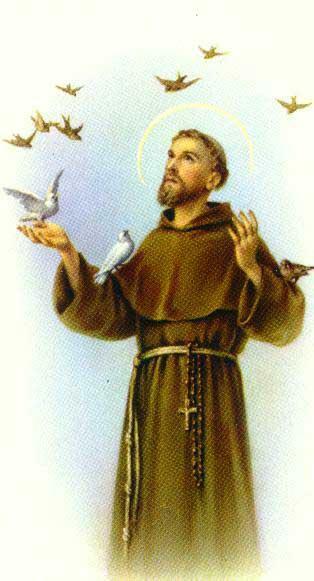 Notice how you never see any bird poop on St. Francis? He should be covered in it.